A commonly used symbol for a standard optical isolator. The current-transfer ratio of a photo-transistor based optical isolator tells you how well it amplifies an input signal to an output signal. For optical isolators with a single phototransistor driver, the current-transfer ratio is normally in the 20-120% range. 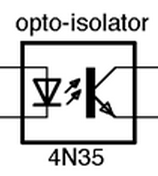 Some optical isolators have phototriac outputs instead of the normal phototransistor output. A phototriac is a triac whose gate is controlled by the incoming light source, essentially the same as what a phototransistor is to a transistor. The internal schematic of an optical isolator with a phototriac output driver rather than a phototransistor. Image from http://www.ti.com/. The outputs of phototriac optical isolators usually go on to drive power TRIACs which switch a mains powered load. To achieve good isolation, different-net pins must be kept well away from each other to prevent arcing. This prevents many small-pitch packages from being used for optical isolators. The two most common packages used for optical isolation components are the through-hole DIP package and the surface-mount SOIC package.